The retina is complex in itself. This thin membrane at the back of the eye is a vital part of our ability to see. Its main function is to receive and transmit images to the brain. These are the three main types of cells in the eye that help perform this function: Rods, Cones and Ganglion Cells. The information received by the rods and cones are transmitted to the nearly 1 million ganglion cells in the retina. These ganglion cells interpret the messages from the rods and cones and send the information on to the brain by way of the optic nerve. There are a number of retinal diseases that attack these cells, which can lead to blindness. The most notable of these diseases are retinitis pigmentosa and age-related macular degeneration. Both of these diseases attack the retina, rendering the rods and cones inoperative, causing either loss of peripheral vision or total blindness. However, it's been found that neither of these retinal diseases affects the ganglion cells or the optic nerve. This means that if scientists can develop artificial cones and rods, information could still be sent to the brain for interpretation. This concept laid the foundation for the invention of the ARTIFICIAL VISION SYSTEM technology. HOW TO CREATE ARTIFICIAL VISION? Figures (3, 4) the dot above the date on this penny is the full size of the Artificial Silicon Retina. Perhaps the more promising of these two silicon devices is the ARTIFICIAL SILICON RETINA (ASR). The ASR is an extremely tiny device. It has a diameter of just 2 mm (.078 inch) and is thinner than a human hair. In order for an artificial retina to work it has to be small enough so that doctors can transplant it in the eye without damaging the other structures within the eye. Groups of researchers have found that blind people can see spots of light when electrical currents stimulate cells, following the experimental insertion of an electrode device near or into their retina. Some patients even saw crude shapes in the form of these light spots. This indicates that despite damage to cells in the retina, electronic techniques can transmit signals to the next step in the pathway and provide some form of visual sensation. Researchers are currently developing more sophisticated computer chips with the hope that they will be able to transmit more meaningful images to the brain. HOW ARTIFICIAL SILICON RETINA DOES WORKS? The ASR contains about 3,500 microscopic solar cells that are able to convert light into electrical pulses, mimicking the function of cones and rods. To implant this device into the eye, surgeons make three tiny incisions no larger than the diameter of a needle in the white part of the eye. Through these incisions, the surgeons introduce a miniature cutting and vacuuming device that removes the gel in the middle of the eye and replaces it with saline. 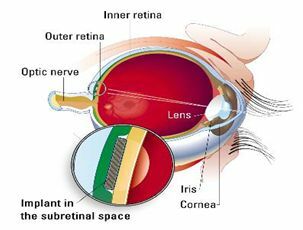 Next, a pinpoint opening is made in the retina through which they inject fluid to lift up a portion of the retina from the back of the eye, which creates a small pocket in the sub retinal space for the device to fit in. The retina is then resealed over the ASR. .Figure 5: Here you can see where the ASR is placed between the outer and inner retinal layers. For any microchip to work it needs power and the amazing thing about the ASR is that it receives all of its needed power from the light entering the eye. This means that with the ASR implant in place behind the retina, it receives all of the light entering the eye. This solar energy eliminates the need for any wires, batteries or other secondary devices to supply power. Another microchip device that would restore partial vision is currently in development called the artificial retina component chip (ARCC), this device is quite similar to the ASR. Both are made of silicon and both are powered by solar energy. The ARCC is also a very small device measuring 2 mm square and a thickness of .02 millimeters (.00078 inch). There are significant differences between the devices, however. According to researchers, the ARCC will give blind patients the ability to see 10 by 10 pixel images, which is about the size of a single letter on this page However, researchers have said that they could eventually develop a version of the chip that would allow 250 by 250 pixel array, which would allow those who were once blind to read a newspaper. The main parts of this system are miniature video camera, a signal processor, and the brain implants. The tiny pinhole camera, mounted on a pair of eyeglasses, captures the scene in front of the wearer and sends it to a small computer on the patient's belt. The processor translates the image into a series of signals that the brain can understand, and then sends the information to the brain implant that is placed in patient’s visual cortex. And, if everything goes according to plan, the brain will "see" the image. Figures (6, 7) illustrating the AV SYSTEM. Light enters the camera, which then sends the image to a wireless wallet-sized computer for `processing. The computer transmits this information to an infrared LED screen on the goggles. The goggles reflect an infrared image into the eye and on to the retinal chip, stimulating photodiodes on the chip. The photodiodes mimic the retinal cells by converting light into electrical signals, which are then transmitted by cells in the inner retina via nerve pulses to the brain. The goggles are transparent so if the user still has some vision, they can match that with the new information - the device would cover about 10° of the wearer’s field of vision. Ceramic optical detectors based on the photo-ferroelectrics effect are being developed for direct implantation into the eyes of patients with retinal dystrophies. In retinal dystrophies where the optic nerve and retinal ganglia are intact (such as Retinitis Pigmentosa), direct retinal implant of an optical detector to stimulate retinal ganglia could allow patients to regain some sight. In such cases additional wiring to the brain cortex is not required, and for biologically inert detectors, surgical implantation can be quite direct. The detector currently being developed for this application is a thin film ferroelectric detector, which under optical illumination can generate a local photocurrent and photo voltage. The local electric current generated by this miniature detector excites the retinal neural circuit resulting in a signal at the optic nerve that may be translated by the cortex of the brain as "seeing light". Detectors based on PbLaZrTiO3 (PLZT) and BiVMnO3 (BVMO) films exhibit a strong photo response in visible range overlapping eye response from 380 nm to 650 nm. The thin film detector heterostructures have been implanted into the eyes of rabbits for biocompatibility test, and have shown no biologicalincompatibilities. The bionic devices tested so far include both those attached to the back of the eye itself and those implanted directly in the brain. Patients with both types of implants describe seeing multiple points of light and, in some cases, crude outlines of objects. Placing electrodes in the eye has proved easier. During the past decade, work on these retinal implants has attracted growing government funding and commercial interest. Such implants zap electrical signals to nerves on the back of the eye, which then carry them to the brain. However, since these devices take advantage of surviving parts of the eye they will help only the subset of blind people whose blindness is due to retinal disease, by some estimates about 30% of the blind. Moreover, scientists don't believe any implant could help those blind since birth, because their brains never have learned to recognize vision. WHAT BLIND PATIENTS WOULD NOT BE ABLE TO USE THIS DEVICE? We believe the device will be applicable to virtually all patients who are blind or who have very low vision. The only ones contraindicated would be a few blinded by serious brain damage, or who have chronic infections, etc. that preclude surgical implants. Patients who have a small amount of vision are not contraindicated. Visual cortex stimulation seems to work the same in both sighted and blind patients. 1. The first and foremost thing is the cost .The miniaturization of equipment and more powerful computers have made this artificial vision possible, but it's not cheap: The operation, equipment and necessary training cost $70,000 per patient. And also may be much higher depending upon the context and severity. 2. It may not work for people blinded as children or as infants, because the visual cortex do not develop normally. But it will work for the vast majority of the blind -- 98 to 99 percent. 3. Researchers caution, however, that artificial vision devices are still highly experimental and practical systems are many years away. Even after they are refined, the first wave will most likely provide only crude images, such as the outline of a kitchen doorway. It does not function as well as the real eye, and does not have crystal-clear vision (as it is only a camera).The device is a very limited navigational aid, and it's a far cry from the visual experience normal people enjoy. 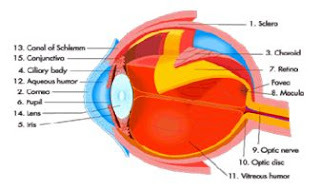 The main aim of Artificial Vision is to restore some degree of sight to the profoundly blind. Since blindness can result from defects at many different points along the visual pathway, there are accordingly a wide variety of proposed models for an "Artificial Eye". The earliest stage of visual processing is the transudation of light into electrical signals by the photoreceptors. If this is the only process that is interrupted in a blind individual, he or she may benefit from a Sub-Retinal Prosthesis, a device that is designed to replace only the photoreceptors in the retina. 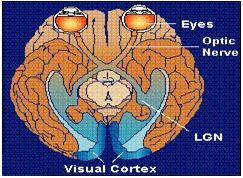 However, if the Optic Nerve itself is damaged, the only possibility for restoring sight is to directly stimulate the visual cortex. Cortical prosthesis is designed specifically for this task. Although the categories presented account for most of the research in Artificial Vision, there are a few more exotic techniques being developed. One of these is the BioHybrid Implant a device that incorporates living cells with man-made elements. Regardless of the specific design, all of these devices are working towards the same goal-- a permanent replacement for part of the human visual system. The electronic eye is the latest in high-tech gadgets aimed at helping millions of blind and visually impaired people. Although the images produced by the artificial eye were far from perfect, they could be clear enough to allow someone who is otherwise blind to recognize faces. The first useful artificial eye is now helping a blind man walk safely around and read large letters. Several efforts are now underway to create vision in otherwise blind eyes. While technically exciting, much more work in this area needs to be completed before anything is available to the majority of patients. Research is ongoing in two areas: cortical implants and retinal implants. There is still an enormous amount of work to be done in developing artificial retinas. In recent years, progress is being made towards sensory distribution devices for the blind. In the long run, there could be the possibility of brain implants. A brain implant or cortical implant provides visual input from a camera directly to the brain via electrodes in contact with the visual cortex at the backside of the head. 1. Humayun MS, de Juan E Jr., Dagnelie G, et al. Visual perception elicited by electrical stimulation of retina in blind humans. Archives of Ophthalmology; vol 114. I really like reading this blog. In this blog, everything is written very clearly. Thanks a lot for sharing the blog. Keep sharing. Informative blog for me. After reading this blog, I got to know much more about Human artificial eye. Thanks a lot for sharing. Great and a very informative blog for me. I like reading this blog. It's amazing to see what can we accomplish with technology. Recently, I came across with this glasses for visual disability. It reads text, identify products and even recognize people's faces. The blind assistive technology aims to help partially sighted people achieve greater independence.